MICO was founded in 1975 by Sotirchos Constantine at Haidari. A key item was the construction and production of gadgets and stainless steel products. In 1996 the company came to the hands of John Sotirchos. Over the years, by understanding the requirements and market needs, we extended our production and our product range. Through the new website we present you the new product line. 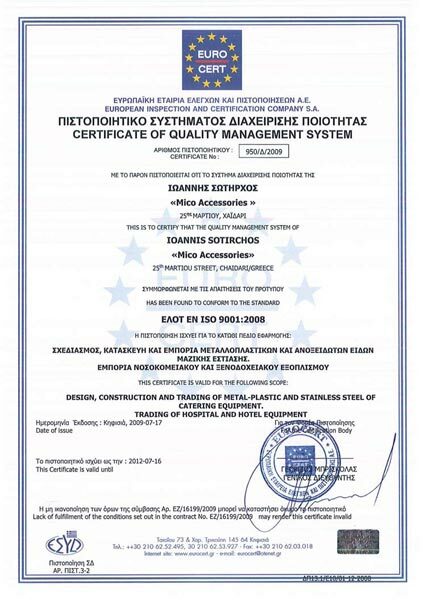 With a modern production team and a sophisticated network of wholesalers in Greece, the company won a significant share of the Greek market. We would like to thank you for your trust in us and pledge that we will continue with the same excellent quality and very complete technical support.